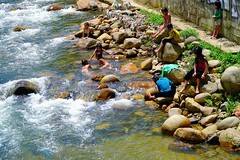 Diamond Island is located at street 154 (Dekcho Damdin), Sangkat Tonles Basak, Khan Chamkamorn. The Cambodia-Vietnam Friendship Monument is a large concrete monument that was built to commemorates the cordial relationship between the Cambodia and Vietnam. 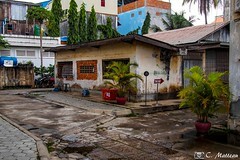 It was built in the late 1970s by the Vietnam backed regime that took power after Khmer Rouge. The monument consists of two soldiers standing guard over a Cambodian woman holding a baby, on a plinth. The style of the figures has been described as 1930s ‘Soviet realism’. The statue is located Sothearos Boulevard, Near the corner of Sihanouk Boulevard in the middle of Hun Sen Park. Wat Prayuvong (Prayuvong Pagoda) is located on hidden away to the east of Norodom Blvd, about 300 meters southern of the Independence Monument. On the roadside of Wat Prayuvong is the centre for the manufacture of artifact. 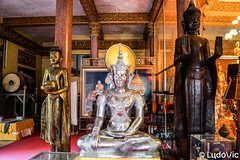 There is a neighborhood of workshops produce Buddha statuary and ritual objects destroyed by the Khmer Rouge and the manufacture of objects for contemporary practitioners of Buddhism, including gaudy cement Buddhas, Bayon heads, nagas, and mythological figures. They are made in concrete, the artistry remains elaborate and statuettes fascinating, but a number of artists there also do religious paintings, some of which are quite impressive in their scale. So you can walk around the various workshops and watch the artisans at work. Wat Langka is one of oldest pagodas in Phnom Penh funded in 1442. It was established as a sanctuary for the Holy Writings and a meeting place for Cambodian and Sri Lankan monks. The Pagoda was named in honor of these meetings. Langka Pagoda was used as a storehouse during the Khmer Rouge era and therefore manage to avoid total destruction. The temple still plays an important role in Cambodian Buddhism and many of the monks here are highly regarded teaches. 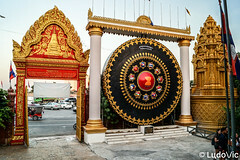 Wat Langkar is located on Preah Sihanouk Blvd, just southwest of the Independence Monument. Choeung Ek, 15 kilometres from Phnom Penh, is Cambodia’s best known Killing Field. It is one of the places, where the Khmer Rouge regime executed about 17000 people between 1975 and 1979. More than 15,000 people, transported from Tuol Sleng, are believed to have been murdered here, some shot, many simply bludgeoned to death. In the center of the area is a 17 story glass stupa which is containing thousands of human skulls and long bones. A boat trip is an excellent way to get a way from the busy and noisy streets of Phnom Penh and just enjoy a relaxing afternoon and sunset on Tonle Sap and Mekong River. A boat cruise typically takes about 1 – 2 hours and runs up the Tonle Sap River along the central riverfront area providing a photographic view of the Royal Palace and Phnom Penh skyline. The cruise continues across the Tonle Sap and up the Mekong River which will give you a sense of the country side close to Phnom Penh. You can also turn the boat trip into a party either by asking the boat owner to arrange food, drinks and music or you bring it yourself. If you are bringing your own music don’t forget to ask the boat owner in what format you need to bring it in. 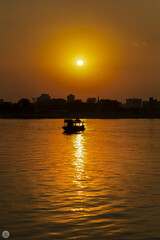 Short river cruises and sunset cruises are easy to arrange, the tourist boats are clustered together on the river along Sisowath Quay (Riverside) on the corner of street 118 . The price of the boat tour depend on the duration of the trip and the size of boats and not the number of the passengers. Small boat ( up to 20 passengers) cost about 15$/h , medium size (up to 30 passengers) about 20$/h, large size (up to 40 passengers) about 25$/h. Note: The price of hiring is the same between expat and Khmer. Independence Monument (Vimean Ekareach) was built in 1958 as a memorial to Cambodia’s independence from France in 1953. 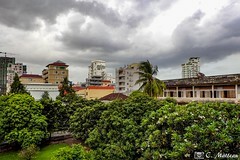 The Monument was designed by Vann Molyvann, an influential Cambodian architect, he has also designed the Olympic Stadium and many other buildings from the 1960-70s in Phnom Penh. Independence Monument is designed in a Angkorian style, shaped as a lotus-shaped stupa that consists of five levels and every level is decorated with snake heads. The monument is at its most impressive later in the afternoon when the shadows are highlighting the complexity of the design. At night time, the monument is beautifully lit up by red, blue and white floodlights, representing the colors of national flag. 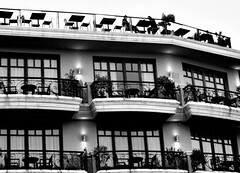 You will find Independence in the intersection of Norodom Boulevard and Sihanouk Boulevard in the centre of the city. At the 9th of November every year Cambodia celebrates its Independent day, during this celebration the Independence Monument is the center of the activities. A ceremonial flame is lit on pedestal inside the monument by a royal representative or a high official, and floral tributes line the stairs. Walking in the monument is not permitted but its best view from across the street. The National Museum of Cambodia is located on Street 13 in central Phnom Penh, next to the Royal Palace. The visitor’s entrance to the compound and the admissions ticket booth are at the corner of Streets 13 and 178. The museum houses one of the world’s largest collections of Khmer art, including sculptural, ceramics, bronzes, and ethnographic objects. The Museum’s collection includes over 14,000 items, from prehistoric times to periods before, during, and after the Khmer Empire, which at its height stretched from Thailand, across present-day Cambodia, to southern Vietnam. 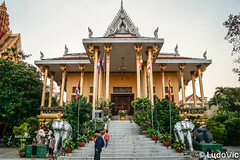 The Museum buildings, inspired by Khmer temple architecture, were constructed between 1917 and 1924, the museum was officially inaugurated in 1920, and renovated in 1968. Tuol Sleng is a former high school that was transformed into one of the most infamous prisons, Security Prison 21 (S-21), in Cambodia during the Khmer Rouge era. The name Tuol Sleng translates to ‘hill of poison tree’ but many Cambodians the prison was called “Choul min dael chenh” – the place where people go in but never come out. In August 1975, four months after the Khmer Rouge took control over Cambodia, this High School was turned into a prison and interrogation center by Khmer Rouge. They renamed the High School to Security Prison 21 (S-21) and reconstructed the building into a prison. The classrooms were converted into tiny cells and torture chambers, all windows were covered with iron bars and the buildings were enclosed in electrified barbed wire. During the four years S-21 was in use over 17 000 people were imprisoned and killed at this prison. Only six people are known to have survived the prison. In 1979 the Vietnamese Army invaded Cambodia and the prison was uncovered. 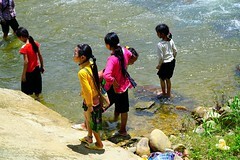 When the Vietnamese Army found S-21 the prison staff had already fled leaving thousands of written documents and photographs of all the people that had been imprisoned at S-21. Altogether more than 6 000 photographs were found and these photographs are still remaining at the museum today. In 1980, the prison was reopened by the government of the People’s Republic of Kampuchea as a historical museum memorializing the actions of the Khmer Rouge regime.